The garage door springs are arguably the most important parts of the system. In both manual and automatic garage doors, the springs are absolutely crucial to keeping the door in balance, and making sure it stays open in a safe and stable manner. They counterbalance the door's weight by accumulating tension in their coils. They extract and contract when the door opens and closes accordingly. One opening and closing is considered a full, single "Cycle". Most springs nowadays have about 10,000 life cycles, so you can count on their operation for a few good years at least. What makes a 3 year old spring to snap all of the sudden, while having so many good years ahead? There could be several possible options, but the one that's most likely is changes in the door's weight. For example – bottom seals. These long strips of rubber don't sound too heavy, but your springs were meant to work with a very specific weight. Another plausible reason, which happens quite a lot, is replacing a broken panel with a similar one that differs in weight. It's basically the same. 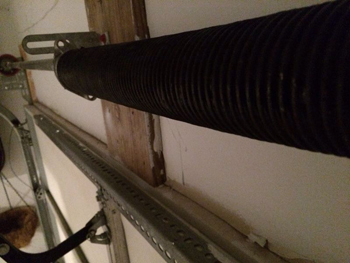 A broken garage door spring is very dangerous to handle by unexperienced hands, so you should act with caution. If you need to have your spring replaced, count on our experts for the best, safest and most professional service around.